How can our friendly electrical contractors help you? The experienced electricians of Mr. Electric® of Greater Seattle specialize in providing residential and commercial electrical service and repair. Whether you need a simple home repair or have a more detailed commercial project reserved for an expert electrical contractor, we can help. We proudly service the entire Seattle metro area and surrounding cities, from Bellevue to Lynnwood and Northgate to Renton and are one of the few electricians providing 24 hour on call emergency service. We get it right the first time, delivering the most comprehensive services available, including installation, upgrade,and repair solutions. You can feel confident calling Mr. Electric's Seattle electricians, knowing that our highly trained professionals will treat you, your family, and your property with the respect and attention to safety you deserve. Having served this community for many years as a quality electrical contractor, we have come to understand our customer’s needs for quality and experienced electrical repair services - both residential and commercial. With over 30 years of experience, you can trust that we have the expertise to solve any issues your home or business may have. With the instilled Service Philosophy of Mr. Electric, we can guarantee that you will receive the best customer service available every time we serve you. Our Seattle Electricians Provide Service 24 Hours a Day! We are a locally owned and operated company, and as a result, we are able to provide 24/7 electrical services to your Seattle area home or business. We understand that electrical emergencies don’t always happen during standard work hours. Whether you need assistance at 2 a.m. on a Saturday in Bellevue or 10 p.m. on Tuesday in West Seattle, we will be available. Whether it's hanging a ceiling fan, installing a custom-designed landscape lighting system, or rewiring a commercial structure, you can call Mr. Electric. Our team specializes in installation of specialty light fixtures as well as any of our other residential or commercial services. We have the power to make things better and we want to be your local Seattle electrician that also serves all the surrounding communities of Bellevue, Northgate, Everett - Marysville, and South King - Renton. We are a very customer oriented company and we care about the experience received through our electrical services - this is why we love to hear customer feedback! If you would like to share your experience or see past customer’s experiences with us, please visit our Google+ page. When you hire an electrician to work in your home, you probably want someone you can trust, and that trust is something that Mr. Electric of Greater Seattle works hard to earn from our customers throughout Seattle, WA. Our electricians are not only licensed, certified technicians but also career professionals who have been thoroughly screened prior to being hired. When you need an electrician, trust in the professionals at Mr. Electric of Greater Seattle. We serve homes and businesses throughout Seattle and the surrounding region, and we have the power to make things better for you. Call today with any questions or to schedule an on-site estimate. There will always be new advancements made in the electrical industry and you can trust that our technicians will be on top of those advancements. More developments are being made to control thermostats, lighting, and appliances with a touch of a button from a tablet or smartphone. Mr. Electric makes it a point to bring that technology into your home to help reduce energy consumption and create ease of use through wireless lighting controls. Accent and specialty lighting designs are fantastic ways to draw attention to the beautiful design of your home or business. Help change the mood or environment of a room by installing accent lighting to bring out the best of your home design. You can add greater elegance to your home through specialty light fixtures like chandeliers. Our professional electricians and electrical contractors can wire new light fixtures anywhere in your home or business to add that wow factor you have been searching for. Adding safety and security to your home is achievable through motion sensor and timer lighting. You can add security lighting to the outside of your home through landscape or flood lighting. Addition of safety lighting for maneuvering pathways or driveways is achievable through the installation of decorative landscape lighting. Sleep the night away with ease once you have called Mr. Electric of Greater Seattle to install your safety and security lighting. Imagine outdoor activities with friends and family in the comfort of your beautifully lit patio and landscaped areas. Evening BBQ's and summer is here! Now is the time to make your summer dreams come true. Our service professionals have the expertise to help you create the perfect landscape design for your home, and we can often do the work on the same day. 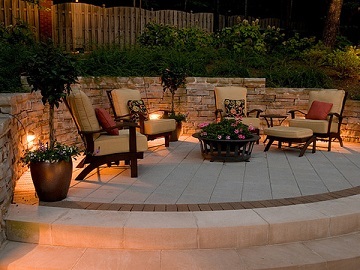 Call now to get a free exact price on your landscape lighting project.